Brand new, we're offering a FREE sampler collage sheet. 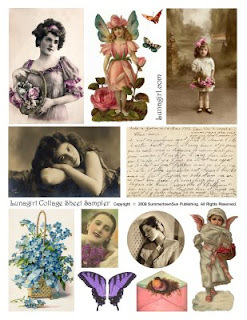 For those who are new to digital images and downloading, please try it out and see how quick and easy it is to purchase your collage sheets this way! CLICK ON THE PICTURE BELOW to go to the page, then use the ADD TO CART button there to purchase. There will be no charge, and you can download, print, and start using the collage sheet today. This is also a chance to experience our image quality -- and just get some lovely images to use in your crafts and art projects. Best Wishes from Lunagirl -- Have fun! Alice in Wonderland Collage Sheets - New Designs!